Some days you just feel like a particular item no matter what…after a migraine from hell I had yesterday (seriously the worse migraine I had in my whole life), I was thinking to go to the Emergency room so that I could function. It’s over now but I still feel dizzy from yesterday’s nightmare, I am still in the mood for making/baking whatever …”ing” something. I have no idea why but I woke up with an orange craving, a migraine along with a pregnant woman symptoms is not really the best scenario. Anyway, I was supposed to go to a wedding reception and since I am still struggling with the leftover migraine of yesterday, I decided to stay home and rest and play with oranges. 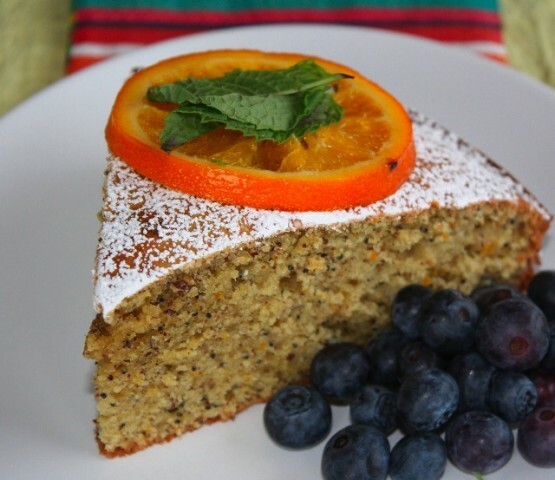 My mom makes this cake but instead of poppy seeds she uses chocolate chips, and it’s really a splendid cake, the chocolate and the orange are a perfect match. Since I had no chocolate chips, and a huge container of poppy seeds, I thought that would work as well…and it did. The cake ended up very light and fluffy. Actually, I was quite happy the way it turned out, and about my humble baking abilities, since I did not put too much thought into it, and that I am not a sweet tooth type of a person, besides everyone who ate it, loved it. I guess sometimes, the public is your best judge. I am trying to figure out if I should measure in metric system then convert into imperial or vice versa. I really hate the imperial system of ounces and pounds. I still cannot figure it out and I think never will. So for this cake, I used the cups and converted into grams but I think it’s not really accurate in metrics. My scale just died so I used my cup measurer and not certain it’s that accurate, but the cake turned out great. My next purchase will be a new scale…and that will be today. In a container mix eggs and sugars, add heavy cream and oil. Mix well. Add orange juice, orange zest, orange peel powder and orange blossom water. Add almond meal, flour and poppy seeds. Mix to obtain a nice and smooth batter. Add baking soda and baking powder. Mix again. Bake in a non-stick pan in a pre-heated oven at 375F for about 30-40 minutes. For the candied orange, slice an orange crosswise in thin slices. Bring water to a boil, and add orange slices for 3 minutes. Drain them. In a non stick pan add 2 tbs honey and cook orange slices in honey for a few minutes. Then remove and place in a 375F oven until they’re become dry, about 30 minutes. Sprinkle cake with powdered sugar and place candied oranges on top. This entry was posted by silvia on September 8, 2009 at 9:18 am, and is filed under Breakfast/Brunch, Desserts. Follow any responses to this post through RSS 2.0.You can leave a response or trackback from your own site. thanks for thinking of us Yanks with the conversions. I use a free converter on my iPhone when making my European friends’ recipes. Weird about the orange craving too..maybe your body was yelling at your for some vitamin C.
The cake looks light & lovely. Cheers! Great recipe, I’m from florida, and we love our oranges! I hate the imperial system too. I grew up in Thailand where metric system is the standard. In Canada, though we’re supposed to use metric system, but since we’re so close to the US, I still see the Imperial system on many things. Your orange cake looks lovely. Great photos. i adore anything with orange flower water!! That looks just delicious. 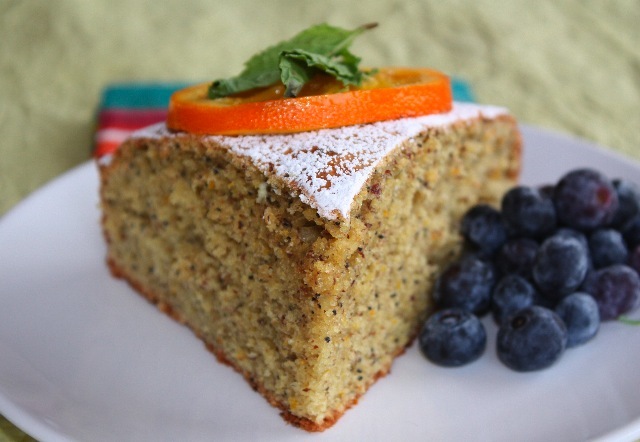 i love citrus and poppy seed cakes, so light. votre blog est vraiment merveilleux!! !